Embark on a train journey from Pretoria through Namibia in grand, golden rail fashion from the past. Your 8 day rail journey on Rovos Rail takes you on an adventure to Kimberly, diamond mining central and the fertile wine growing region of Upington. Explore fish River canyon, the second largest canyon in the world. Tour the European capital of Namibia, Windhoek. Take a desert drive through Sossusvlei, the Namib Desert, and see old pinkish orange and reddish sand dunes. Stay at a game lodge in Mokuti and take an early morning ride to the Etosha Pan, the largest game reserve in the world. All Aboard Namibia is a regal rail sojourn across vibrant Africa. Arrive in Johannesburg where you will be met and driven to your hotel in Pretoria. Transfer to the private train station at Capital Park where you will board the Rovos Rail, Africa’s finest trains in the old colonial fashion. Suites are Edwardian style and reflect the Golden Age of train travel. Wood paneled classic coaches have been remodeled and refurbished to mint condition. The on board cuisine is five star luxury. Recapture the romance and atmosphere of a an era long ago, when privileged travellers experienced the magic of Africa in an elegant fashion. Depart at 3:30PM. Enjoy dinner and drinks on board this evening before retreating to your suite. Ten minutes before arriving in Kimberley there is a shallow lake where, on most occasions, there are spectacular flocks of Flamingos. Arrive in Kimberly at 10:00AM. Kimberley is somewhat off the beaten track and one of South Africa’s best-kept secrets. Tour the Big Hole and the Diamond Museum. Kimberly has considerable historical significance due its diamond mining past. Since diamonds were initially discovered on a main hill in Kimberly miners arrived in thousands, the hill disappeared, and became known as the Big Hole. Notable personalities made their fortune here such as Cecil Rhodes and the De Beers corporation. Learn about this famous mining history at the Diamond Museum. Depart at 12:45PM. Lunch and dinner are both served in the dining cars. Breakfast is served in the dining cars. The train arrives in Upington. Disembark the train for a walking tour of Upington (2 hours). This town originated as a mission station until 1875. The landscape is very arid but the soil is fertile with many fruits and other crops grown in irrigated fields. The area is best known for its grapes, raisins and wines, which are cultivated on the flood plains of the Orange river. Lunch and dinner are served in the dining cars. Arrive in Nakop for border formalities to enter Namibia. The train arrives in the Holoog siding. Breakfast is served in the dining cars. Disembark for a visit to the Fish River Canyon. This canyon is the second largest canyon in the world and the largest in Africa and often compared to our Grand Canyon. After returning to the train we depart Holoog for Keetmanshoop. Lunch is served in the dining cars. After lunch, disembark for a walking tour of Keetmanshoop (2 hours). This town was named after Johann Keetman, a German industrialist and the city’s founder. The town is situated in a semi-arid area. Dinner is served in the dining cars. Breakfast is served in the dining cars. Arrive in Windhoek at 10:00AM. Visit the Train Station Museum and tour Windhoek City, a highly European influenced capital city of Namibia . Board an aircraft for a 1 hour flight to Sossusvlei. This area is characterized by high sand dunes of vivid pink-to-orange color due to a high percentage of iron in the sand. 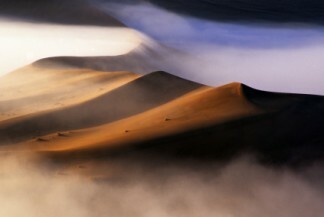 This area is a fascinating part of the southern Namib Desert. Note that the oldest dunes are those of a more intense reddish color. Enjoy lunch at the lodge upon arrival. Take an afternoon desert drive and enjoy a bush dinner at the lodge. Overnight at the lodge.. Enjoy an early morning desert excursion with breakfast on the way. Depart Sossusvlei for your flight back to Windhoek. Board the train. Lunch is served in the dining cars. Dinner is served in the dining cars. Breakfast is served in the dining cars. Arrive in Tsumeb, the “gateway to the north” of Namibia, at 11:20AM. Transfer to Mokuti Lodge for lunch, game drive, dinner and overnight stay at a lodge. Depart by coach from the Mokuti lodge for an early morning game drive into the Etosha Pan, the largest game reserve in the world. Rejoin the train at Tsumeb. Depart Tsumeb at 1:00PM. Lunch and dinner are served in the dining cars. Breakfast is served in the dining cars. Arrive in Swakopmund, a seaside beach resort, at 11:00AM. Disembark. You will be met and driven to your accommodations. The afternoon is free for you to explore as you wish. Take a full day adventure to Cape Cross, 130 kilometers from Swakopmund. Stop to marvel at the extensive lichen fields stretching away to the horizon, east of the coastal road along the way. Visit the holiday town of Henitiesbay, the “Free Republic of Wlotzka’s Baken”, just north of Swakopmund. This self-sustaining settlement of wooden cabins and bungalows on the beach is the haven of many a beach angler. The Cape Cross peninsula is the site of one of the first landings by European seafarers. It was here that Diego Cao erected a stone cross in honor of a safe sea journey from Portugal in 1486. It is also the home of some 200 000 cape fur seals. Return to Swakopmund.